The second factor that dictates the quality of a 3D print is the scanning system. There are five factors that influence the 3D scanning system quality: the lighting, the system calibration, the capture speed, the texture resolution and the geometry resolution. Lighting. As in standard 2D photography, good lighting can make all the difference in producing a high quality 3D photo. The subject should be evenly lit from every side in order to avoid shadows. Even 360 degree lighting is very hard to achieve in standard environments so the best 3D scanners have specialized lighting built in. A good rule of thumb is to avoid scanning in places with direct overhead lighting and direct sunlight as these light sources can overpower the existing lighting. System Calibration. Nearly all 3D scanners come with calibration procedures that must be abided by to achieve maximum quality. For example, DSLR systems require the cameras be moved and focused to capture a particular part of the subject. Capture speed. People are not capable of standing perfectly still. Trust us, we have asked tens of thousands of people to stand perfectly still and watched their best efforts – and most have failed to do so. Even the act of breathing can cause enough movement and problems that the final 3D model will see quality degradation. It is for this reason that the capture speed of the 3D scanning system is critically important. Instantaneous is great, one second is okay and anything longer than one second will cause a good percentage of the final scans to be unusable. Texture resolution. Most hybrid and photogrammetry based 3D scanners have higher texture resolution than what is possible to 3D print. Kinect-based 3D scanners have lower resolution textures because the RGB sensor on them is only 640 × 480 pixels. For 3D printing below a 7 inch size, a 4096 x 4096 texture size is adequate. For printing 7 inches and up or if you’re using the 3D scan for other applications, you will want to make sure to have a 3D scanner that can produce an 8192 x 8192 texture size. Geometry resolution. 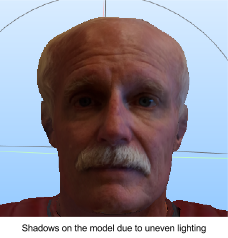 Geometry resolution is how close the 3D scan matches the subject being 3D scanned. Different types of 3D scanning technology calculate depth using different techniques. Structured light or laser line scanners usually give the best depth data. Photogrammetry and hybrid techniques can give good depth data as well if all of the other quality factors are optimized.